Adam Hall and his Aberdeen IronBirds teammates came home after a series win over Tri-City to see the Connecticut Tigers and started five games in three days. The first of two Double header days brought Aberdeen good fortune and two different 6-1 wins. Hall finished the first game going 0 for 4 from the plate with a Strike Out, but in the second game he would have 3 At bats, scoring 1 Run, 1 Hit, 1 Walk and 1 Strike Out. For the fourth straight game, the IronBirds took a 2-0 lead in the first two innings. Willy Yahn led off the second with a single and moved over on Nick Horvath's sacrifice bunt. Jean Carmona brought home Yahn with a single, and came home to score on Alfredo Gonzalez's RBI base knock. 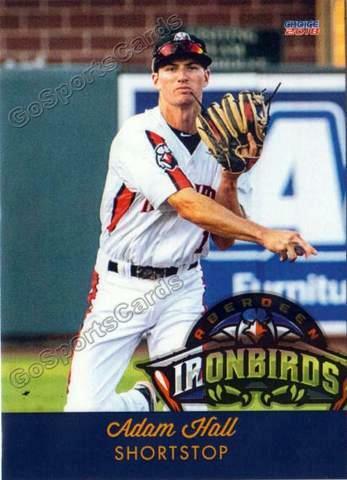 Robert Neustrom got the next two RBIs for the IronBirds. His first came in the third inning on an RBI double that scored J.C. Escarra after his single. Neustrom got another in the 5th inning but took three bags because of it. Yahn would smack one through the infield and score Neustrom in that frame to make it 5-1 IronBirds. Escarra sealed the deal in the 6th with an RBI single to score Jean Carmona on his second hit of the game. Aberdeen cruised through a 6-1 win. The IronBirds would have a Massive third and that's all it would take the seal a win. It started with Robbie Thorburn's first hit in the last eleven games, the next four batters of the inning would all reach and score. RBI's in that inning came for Escarra (2), Yahn, Roberts, Horvath. It was 5-0 IronBirds in the bottom of the 3rd. Kevin Magee got his second start of the season for the IronBirds. He tossed five innings of three hit, scoreless baseball while striking out five. Aberdeen got their last run in the 5th inning. Alexis Torres reached on a drop third strike and scored on an error to make it 6-0.